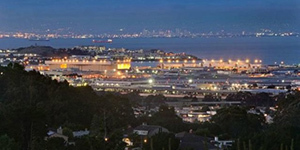 Millbrae has been a constant source of growth along the peninsula for many years. Starting from a much smaller population, and experiencing steady increases for the better half of a century, Millbrae is now home to roughly 22,000 people. Being a smaller city, the residents of Millbrae pride themselves on tackling expansion head on. Primarily, these challenges involve transportation, housing, education and an ever-changing demographic, but the city has improved its infrastructure to handle the emerging growth. The BART and Caltrain station offer public transportation and upgraded downtown residential buildings, have allowed the city to improve its downtown core and demonstrate that this little town packs a big punch. After school and work, residents have a plethora of recreational opportunities to choose from. There are 14 parks in Millbrae, one with a PAR course. Green Hills Country Club is located in the middle of town and, on the western side, lies Crystal Springs Reservoir for the local hiking enthusiasts. The annual Art and Wine Festival in Millbrae is a popular event and typically draws over 100,000 visitors in the first weeks of September. Like many peninsula communities, Millbrae features a wide variety of homes to accommodate all residents. From entry-level condos to sprawling acreage properties, we’re certain we can find a home to suit you. Westward homes that are higher in elevation often have large decks that offer stunning views, while those nearer to Highway-101 are usually smaller and more affordable.